Romeo is a ladies' man, and he's looking for the person who is his soul mate. 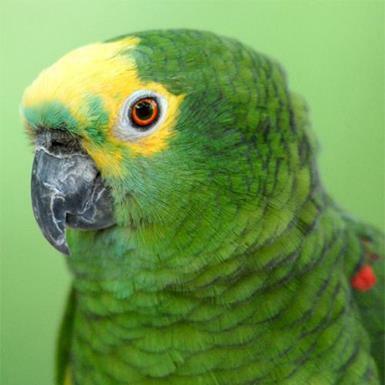 Romeo is a blue-fronted Amazon from Germany. He flew all the way over to the States to live in a home, and he was a great guy. Except for one little problem: He didn't like the lady's husband. So as far as Romeo was concerned, there were too many roosters in that hen house. He's at Best Friends now, looking for a feminine home. Like many Amazons in captivity, Romeo is a little bit overweight. But otherwise, he's in good health. He was born in 1985, and can live 50 to 70 years. He would love to be your new feathery love!